Success may have proved too much for Arthur Brown, as his attempts to keep the Crazy World together ultimately failed. In late 1969 Brown assembled a new band with Theaker returning, and George Kahn on sax, Jonah Mitchell on organ and Android Funnel (Andy Rickell) on guitar. A follow up was recorded, but abandoned. (It did see release decades later as Strange Lands). 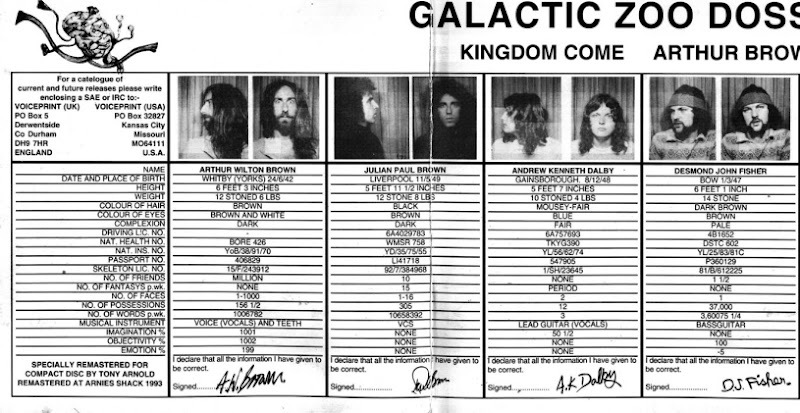 Brown then formed Kingdom Come in 1970 with a revolving cast, including Dave Ambrose, Rob Tait, Andy McCulloch, Andy Dalby and Mike Harris. 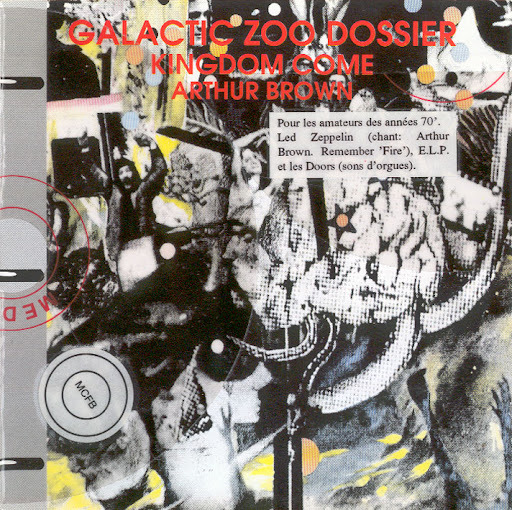 Initial rehearsals from the nascent group were released decades later, but their debut, Galactic Zoo Dossier is a highly crafted progressive classic, and without a doubt, one of the weirdest albums of the era! The album played continuous, as Brown continued his music-as-theatre tradition. In fact, the concert was Kingdom Come’s forte, a self-proclaimed "multi-media experience". 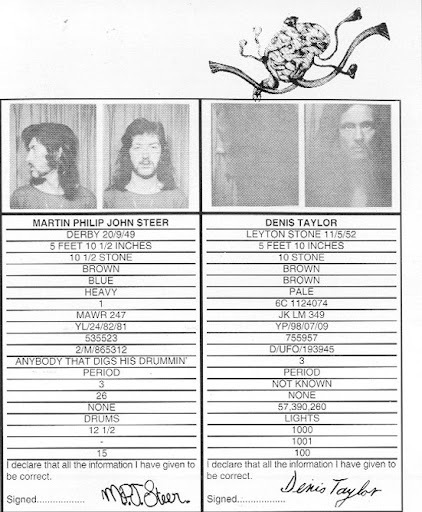 The palette is familiar: "Space Plucks", for instance, co-written with Vincent Crane, contains a classic organ hook and "Gypsy Escape" illustrates the classic Prog jam. Lyrically, Brown had even fewer peers! Others may have written on similar subject matters, but he straddled both the dark and light with equal amounts of fear and humor. The unmistakable voice of Brown and his R&B influences lends a soulful slant to the proceedings, something rare for English music from this period. The album saw release on Polydor in the UK, but despite extensive touring failed to chart.